Most Saturday nights, a group of patients with the congenital form of Minamata mercury-poisoning disease dine together to discuss the challenges they face in coping with the ailment now that they are mostly in their 60s. The focus on a night in early September was Shinobu Sakamoto, who three weeks later was scheduled to speak at the Minamata Convention on Mercury held in Geneva, Switzerland. It was to be her second trip abroad to tell her story to the world, having also made a visit to Stockholm in 1972. Six patients and staff members at a welfare facility in Minamata, Kumamoto Prefecture, talked about their expectations for the convention, which aims to put in place stricter regulations of mercury in the environment as a first step to stop future mercury poisoning cases from happening. Kenji Nagamoto, 58, a patient with a less aggressive form of the disease, broke the ice, raising the issue of the "many" patients who are not officially recognized as sufferers and therefore not eligible to receive benefits. "What can we do for them?" he asked. Kazumitsu Hannaga, a wheelchair-bound 62-year-old who has never been able to speak because of the disease, opened his eyes widely and groaned his agreement. Minamata disease was caused by the release of methylmercury in industrial wastewater by a Chisso Corp. chemical plant in Minamata. The poison bioaccumulated in shellfish and fish in the Shiranui Sea in Kumamoto and Kagoshima prefectures, leading to thousands of Minamata disease victims, many of whom died. Most congenital patients were born in the 1950s and 1960s after their mothers ate seafood contaminated with methylmercury while pregnant. Mercury penetrated the brains of the fetuses through the placenta and damaged the central nervous system, causing symptoms similar to cerebral palsy. The exact number of congenital victims is officially unknown, but the late doctor Masazumi Harada, who first drew attention to the congenital form of the disease, said that around 70 babies were born with mercury poisoning in and around Minamata. About 15 of Sakamoto's friends who also have the congenital disease work at the welfare facility, called Hotto Hausu (Warm House), where some of them live and make eco-friendly bags and name cards with pressed flower art among other activities. They also talk with visitors from around the world about their stories and struggles with the disease. On the opposite side of a table, Yuji Kaneko, 62, smiled quietly while drinking a glass of "shochu," a Japanese distilled beverage. He has been struggling for more than 20 years to regain the ability to walk by himself that he lost when he turned 40. He was born in 1955 in a coastal community in Minamata. The disease afflicted his entire family, with his father dying of the acute type of the disease three months before his birth and his mother and brother also contracting the illness. Kaneko goes to a national hospital established for Minamata disease patients twice a week to undergo rehabilitation while living and working at Hotto Hausu, which began providing support to victims of congenital Minamata disease in 1998. "I believe aging severely affects their physical abilities," said Takeko Kato, the 67-year-old manager of Hotto Hausu, although the cause of acute debilitation in middle age is medically unknown. For many, the congenital form of the disease is like a ticking time bomb. The victims at Hotto Hausu all require wheelchairs except Nagamoto, who can still walk by himself. On a Wednesday afternoon of Oct. 11, an occupational therapist attaches a robot suit called HAL, an electrical apparatus that supports walking, to Kaneko's waist and legs during his rehab session. 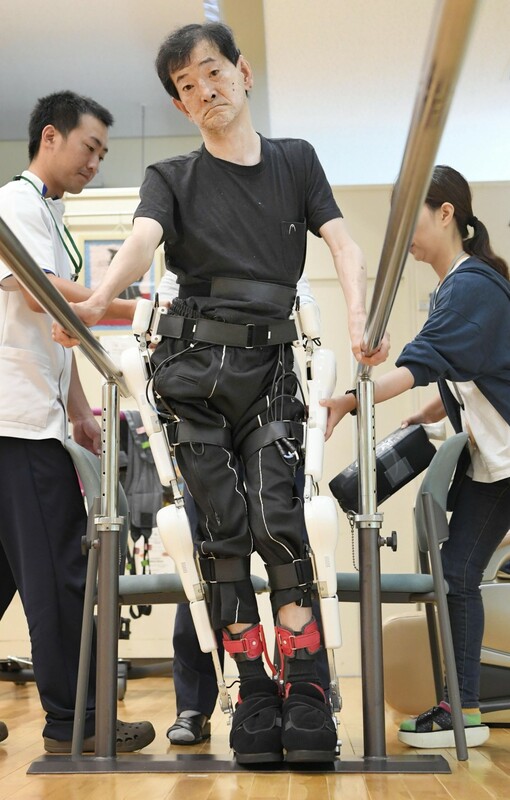 The machine detects brain impulses transmitted to the muscles when Kaneko tries to walk and simultaneously assists his legs to step forward. After grabbing parallel bars, he labors forward for around five meters as the machine clanks noisily. "It was heavy," Kaneko said when asked about his progress. Although his walking has gotten faster, Kaneko still feels the anguish of not being able to control his body movements anymore. For congenital patients, says Kato, no one knows when they may no longer be able to walk. "In congenital patients, we see in particular that they lose speech and motor functions in their 40s. Friends who were able to walk and ride bicycles together are suddenly unable to walk and must use wheelchairs. They worry about when the same might happen to them, and they want to continue walking," said Kato. Kato, a Tokyo native who has been actively supporting Minamata patients since the 1970s, moved to Minamata in 1988 before opening the facility. She wanted to create a facility where "congenital patients could obtain jobs and live to be respected as individuals in their local community." Masazumi Yoshii, a former mayor of Minamata who in 1994 became the first leader of the city to apologize for the municipal government's failure to prevent the spread of the disease, presented an 80-year-old Japanese cypress with a message hoping that all the patients "also live at least 80 years" when the facility was relocated in 2008. The tree, which is a half meter in diameter, stands near the center of the building. As the victims get older and face more difficulties, they continue to convey their message about the disease. On Sept. 28, Sakamoto gave her speech in Geneva. She is no longer able to walk as she could when attending the U.N. Conference on the Human Environment in Stockholm as a 15-year-old. "Minamata disease is not over yet," the 61-year-old said in a quavering voice at the event called "A Moment to Minamata." Sakamoto, who often gets headaches and has slurred speech, donned a white T-shirt with the insignia of persons with the congenital disease presented by her friends in Minamata. "Everyone (who is a patient) just gets worse. I've brought their feelings here with me. Please never let pollution like this happen again," Sakamoto said.